It wasn’t in my plans to meet a handsome, dark Peruvian Peregrino. 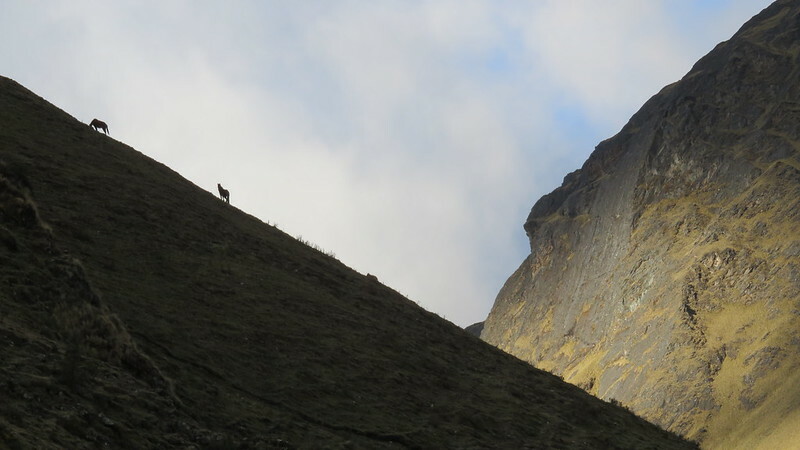 He captured my attention on my way back from a weekend spent at Salkantay, a white glacier-laden peak, another of Peru’s most sacred Apu’s and also, one of the four gateways to Machu Picchu. 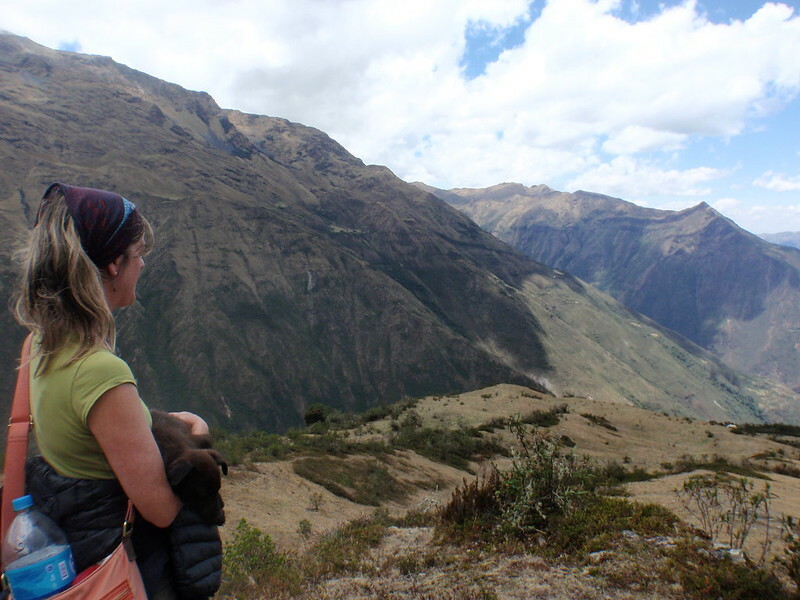 I walked with him for the remaining ten kilometers of the trek and that’s all it took for me to hand my heart over to him. 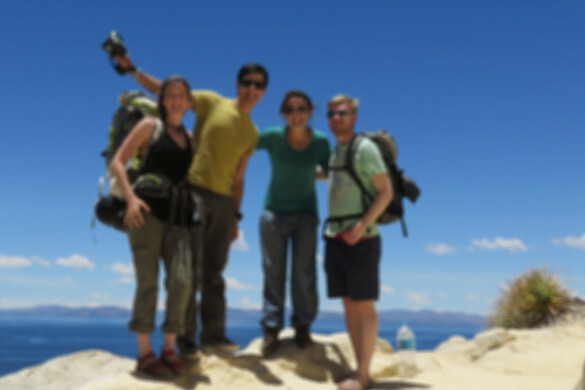 Last week, Inge from Holland, Karen from New York and I planned this trip through the South American Explorer’s Club. 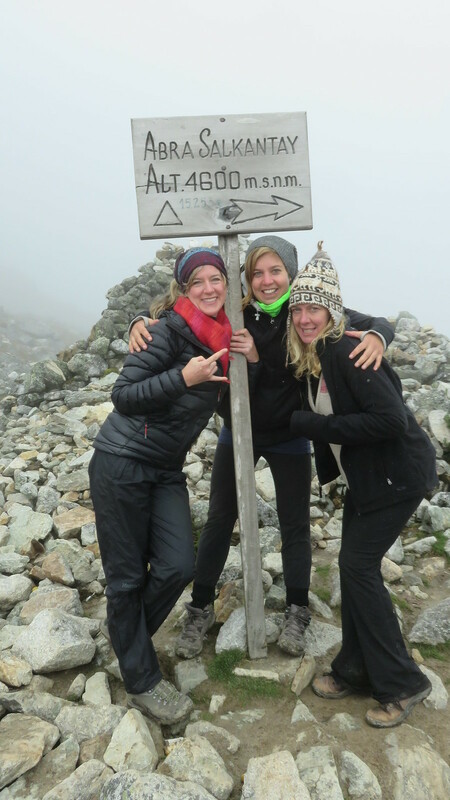 Our intention wasn’t to trek to Machu Picchu, since all of us had previously been there. 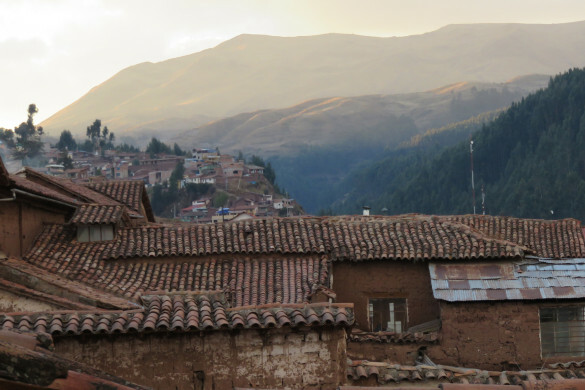 Furthermore, we were on a three-day time limit to make it back to Cusco because Karen had to work. 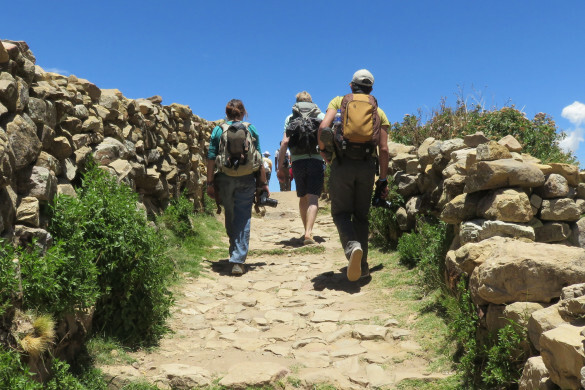 Instead, our plan was to spend time day hiking in the most stunning, mountainous region of the trek, particularly to make it to Salkantay Pass at 4600 meters above sea level. Not everyone understood the logic of our plan. 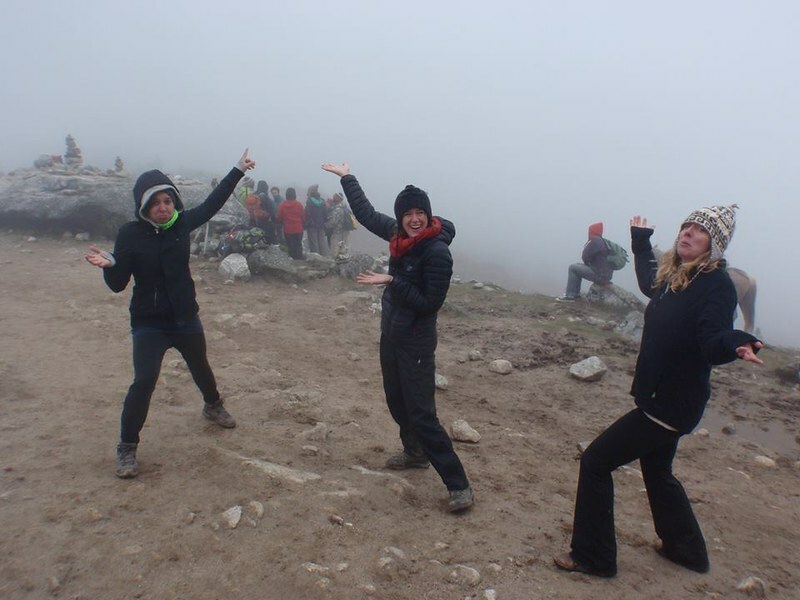 That became quite apparent when some of the guides and trekkers seemed confused as to why we would descend from Salkantay Pass the wrong direction on day two. One woman asked, “Why are you coming back? Were you sick?” and a couple of others pointed out that we were going the wrong way. “Yeah, we know”, I said to myself every time I sensed the confusion. The setting was breathtaking. 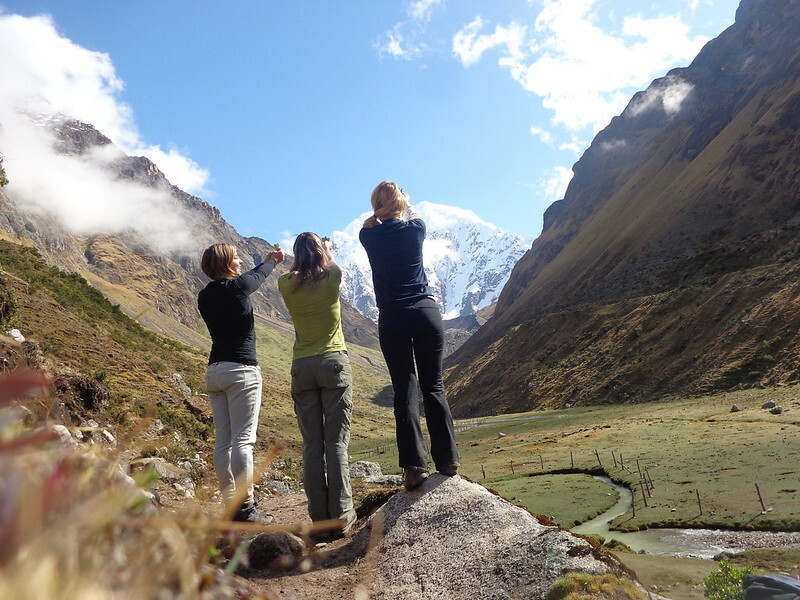 The snowy peaks of Apu’s, Tucarhuay and Salkantay towered brightly and majestically nearby. Horses grazing on the mountain slopes stood silhouetted against the dusky sky. 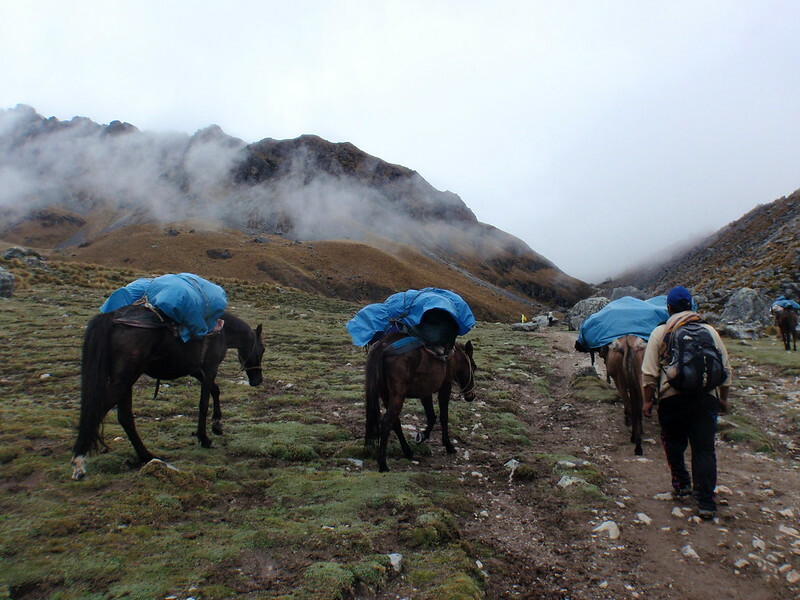 They were work horses and mules I suspected; the ones on a break from the five day trek to Machu Picchu. Why they climbed so high to graze, I am not sure. Maybe to escape as far away as possible from the paddocks where they are normally loaded up with gear? If that’s the case, I can’t say I blame them. Some of the pack horses we saw seemed reluctant to move forward. 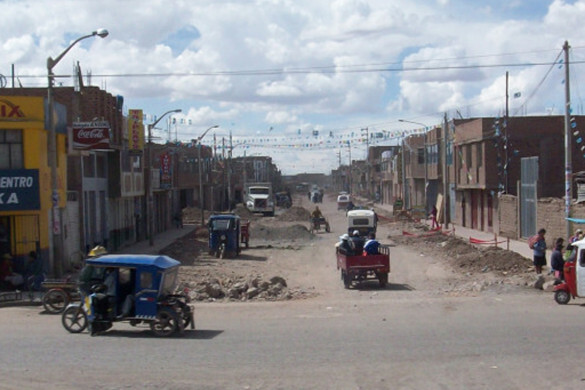 It took two Peruvian cowboys, one at the front and one at the back, to keep them going. The cowboys kept shouting, “Mula, mula! !” and then would occasionally whack the mule’s back end with a rope. Twinkling stars gradually appeared in the dimming sky as the sun sank behind the shadowed mountains. Darkness took over the land quickly, and with the absence of city lights, the full cosmos flickered brightly above. Karen and Inge had collected some branches earlier and after a candle lit dinner we all ventured out to the front yard for a fire and a marshmallow roast with the Peruvian family who hosted us. We weren’t able to find the plain white marshmallows, earlier at the small supermarket, so we had to settle for the colourful flavoured ones. They really didn’t measure up to the usual, but regardless, it was a nice reminder of home to pull the brown bubbling marshmallow crust off the stick and let it melt in my mouth. Later, I brought out my flute. Although it isn’t a typical campfire instrument, it was a huge hit with the Peruvian family who had never seen or heard one before. 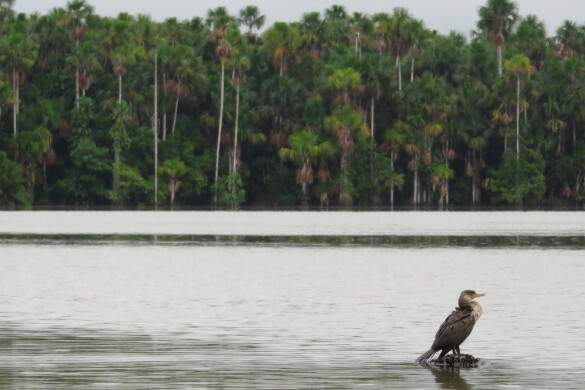 The flutes they are used to are the wooden Pan or Peruvian ones. The oldest girl was the most intrigued and stood beside me for a picture while I played. 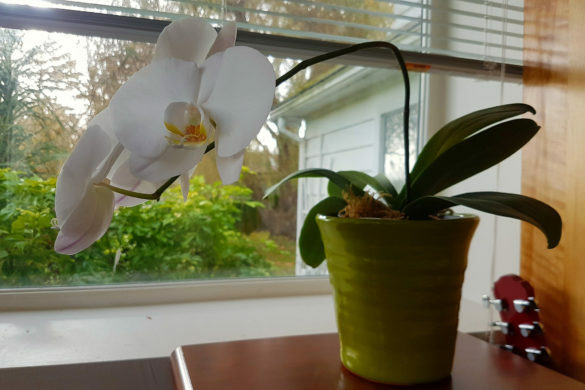 The family thanked me for sharing and expressed how beautiful it sounded. The man asked to hold my flute. He studied it closely and pressed down on the finger pads. Then I let the oldest girl blow into it. Although it was a challenge for her to get a sound out she managed one note and we all cheered at her success. The breeze off the glacier was cold. We sat around the blowing fire all bundled up in our toques and scarves. 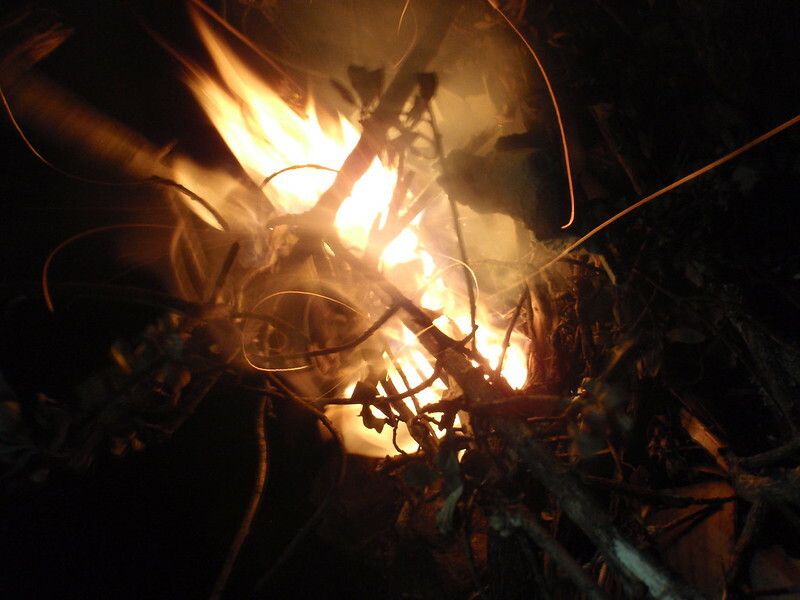 We had used up all of the branches Karen and Inge had collected earlier and without any decent logs to create lasting embers, the fire began to die. 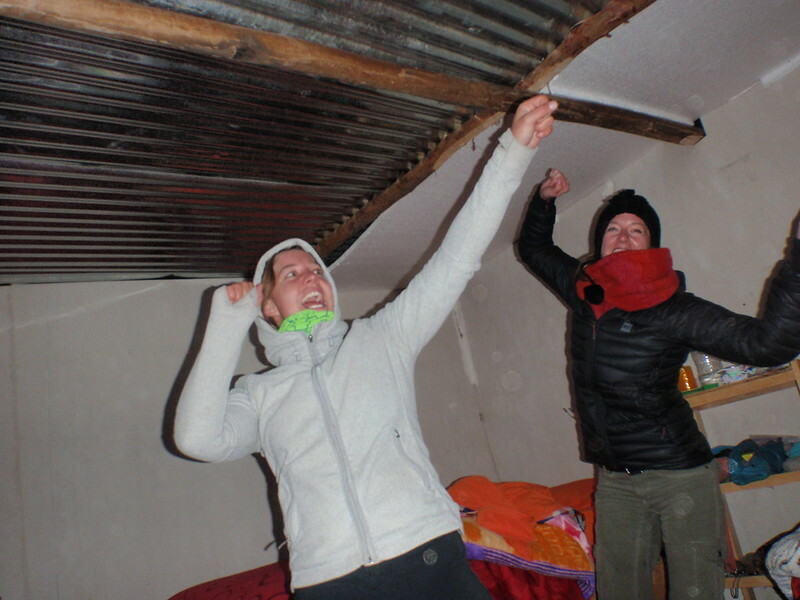 We retired to our rustic cabin to warm up with some calisthenics before jumping into our comfy, thick blanketed beds. 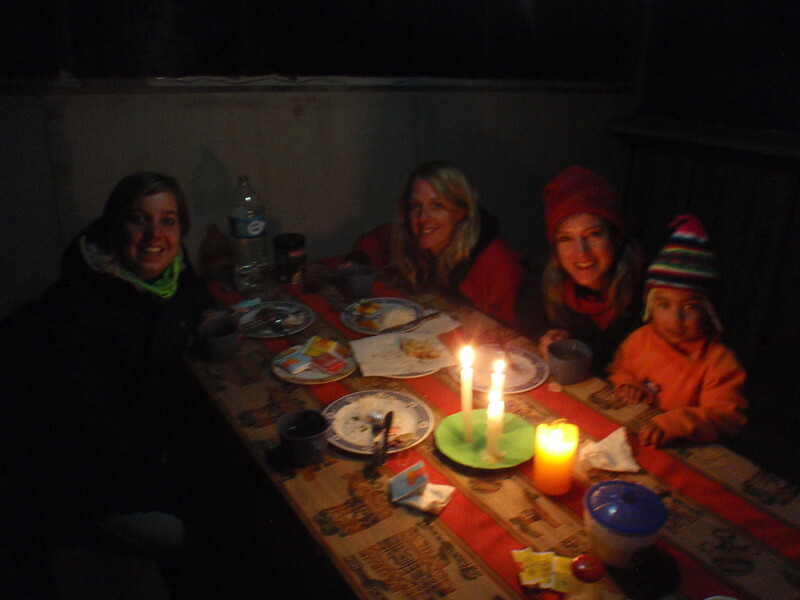 Our wake-up call was at 5:30 a.m. Our Peruvian hostess rapped on our door and brought in some coca tea to help us wake up. Through the open door, I saw that a thick cloud had floated in overnight and settled over the land. 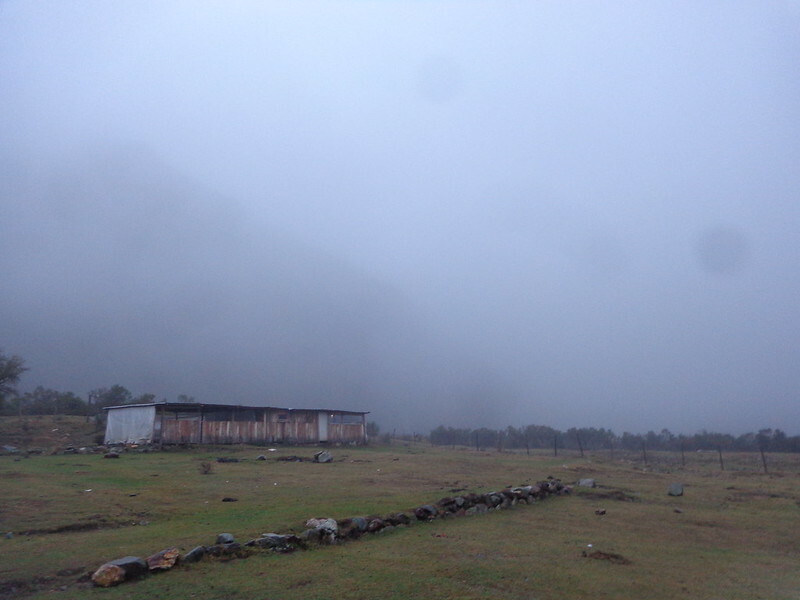 Salkantay was completely invisible. Great. What happened? It was so clear last night; however this is normal in the mountains. The weather can change in an instant, so it’s best to have no expectations and to be prepared for anything. Our hopes of the clouds passing began to fade the closer we got to the pass. More clouds continued to float in. We waited at the pass for close to an hour in hopes the sky would clear enough to catch a glimpse of the gigantic mountain towering somewhere above us. Unfortunately, it didn’t happen. The only hints that the sacred Apu existed next to us were the signs marking the pass and the many cairns scattering the area. 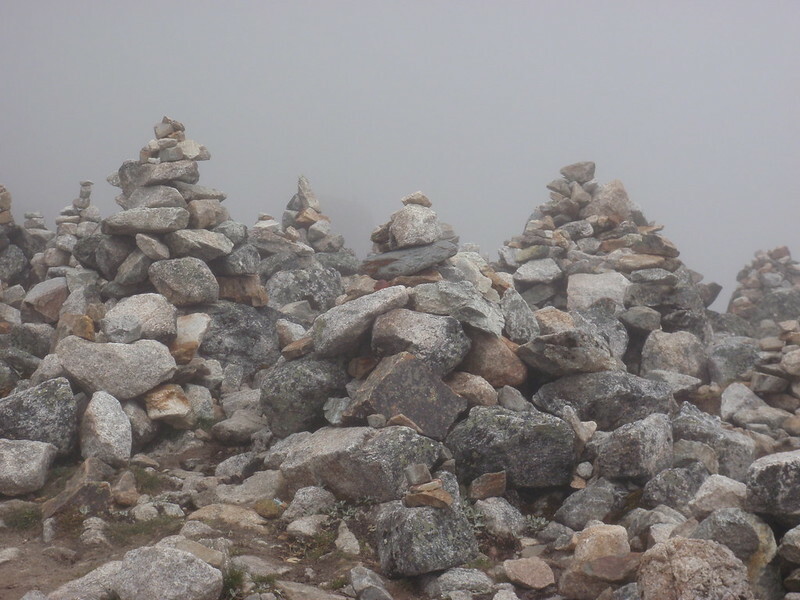 Could the cairns be offerings to Salkantay I wondered? I built a small cairn on top of a large boulder and said a silent prayer. 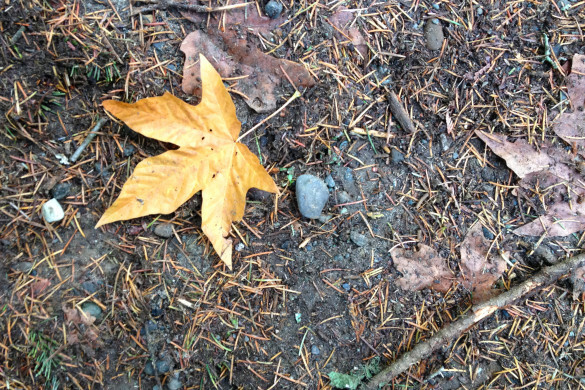 Something was weighing heavily on my mind, so I stood in silence and laid it all out to the sacred mountain spirit. 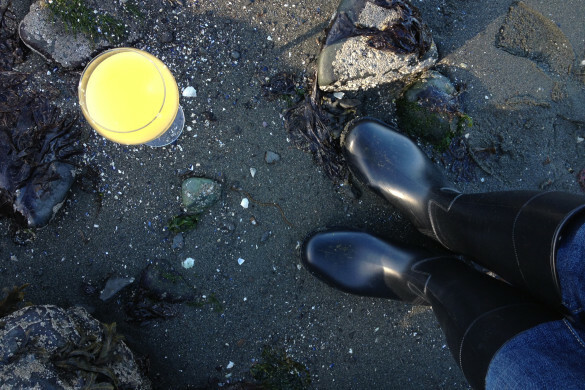 Mist droplets covered our toques and numbness overtook my bare fingers. 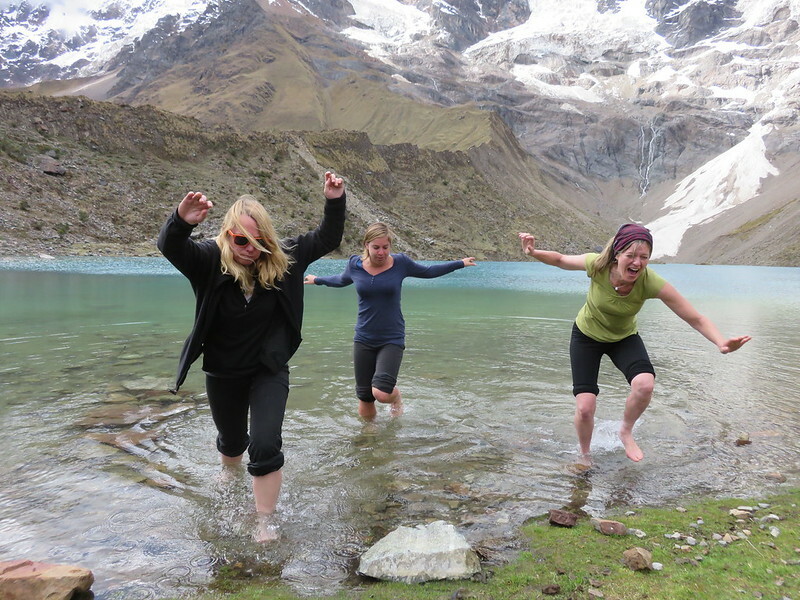 My body heat from the exhausting climb quickly evaporated into the thin air. 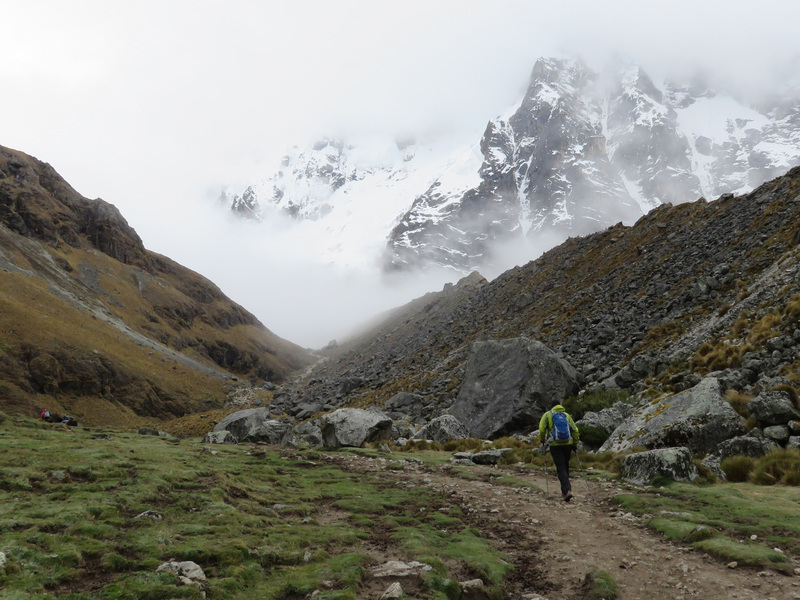 Reluctantly, we began our descent without the view we had hoped for, but when we reached the next clearing the clouds had parted enough that we were able to get a glimpse of Salkantay. We dropped our packs and relaxed for a while. 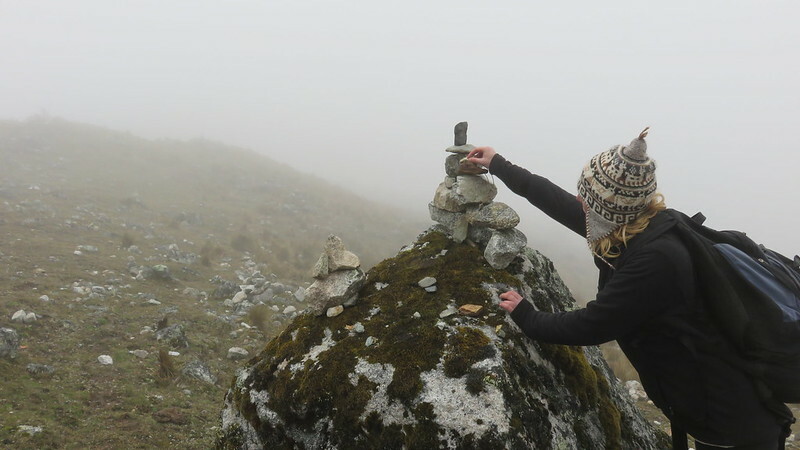 Earlier, at the pass, I had noticed Karen had left an offering to Salkantay on a cairn she had made. I’m not sure what it was about and it’s something I wouldn’t dare ask about. It was personal, like my own prayers, I am sure. An offering is something I should have thought about bringing before I came up here. The only thing I had was music, so I dug my flute out of my pack and played. 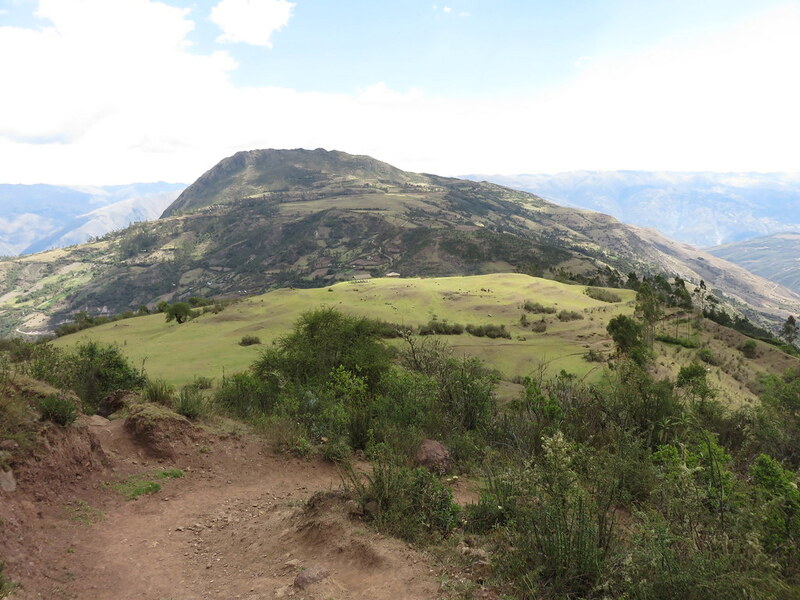 The clouds continued to slowly clear as we descended back into the village of Soraypampa. 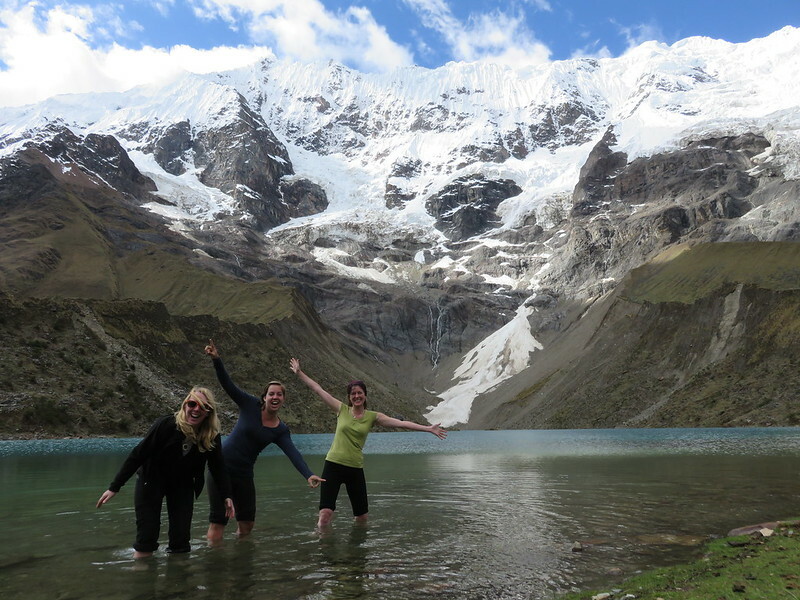 If we didn’t get to see Salkantay from the pass, at least we got to see Tucarhuay and the gloriously turquoise blue lake. By the time we got there it glittered like an emerald under the warm sunshine. It looked inviting and even though we logically knew a glacier fed lake would be painfully cold, we decided to walk in to sooth our aching feet. When we awoke on our final morning Inge yahooed at the scene outside of our bedroom door. 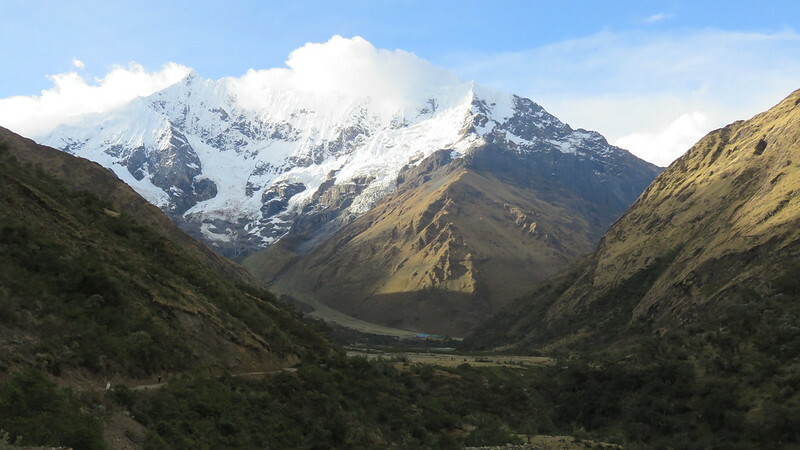 Salkantay’s bright snowy mass stood unveiled. 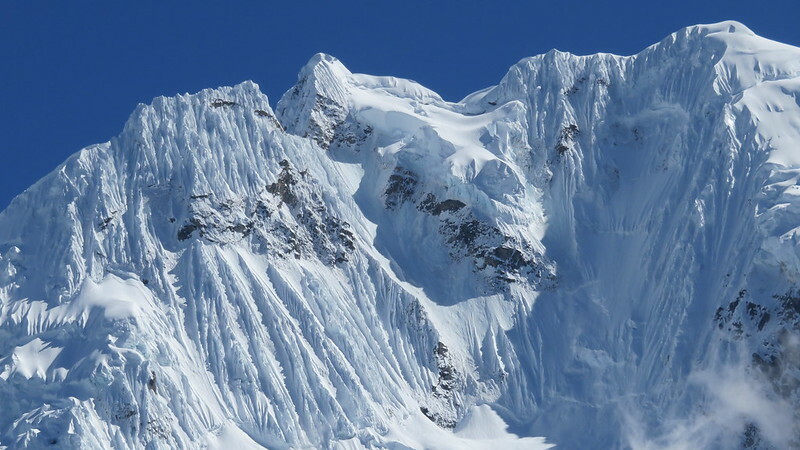 Would we have enough time to hike up to the last clearing before the final ascent? Not likely, but we would try. 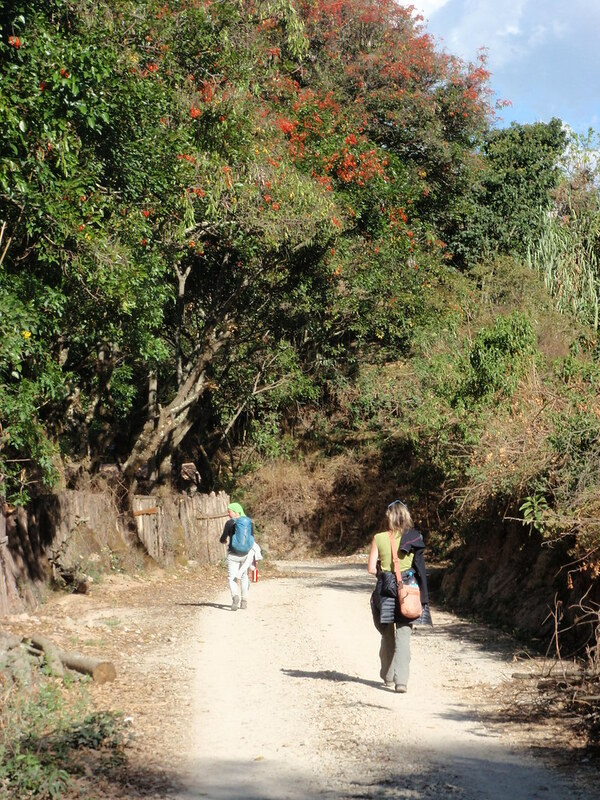 The trek back to Mollepata was 18 kilometers as it was. We were determined, but even that wouldn’t get us as far as we would have liked. 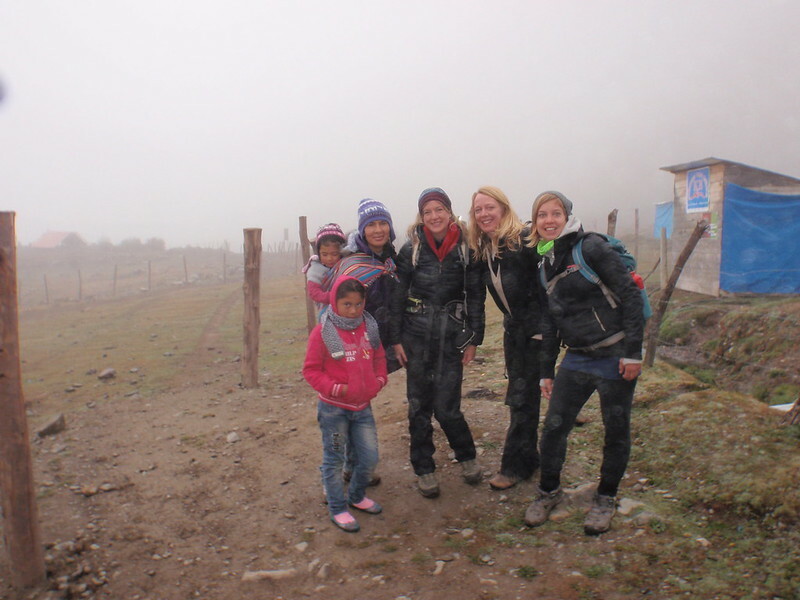 We stopped at the first clearing, took some photos and then performed a coca leaf ceremony to Salkantay. Again, I repeated the prayer that weighed so heavily on my mind and then I blew my coca leaves so hard that I had to take a step back. Karen laughed and said it must have been a prayer made with huge intention. I smiled to myself. Yes, it was. My prayer was eventually answered, but in my mind the sacrifice I made for it came in the form of this handsome dark Peruvian peregrino I met on the trail. 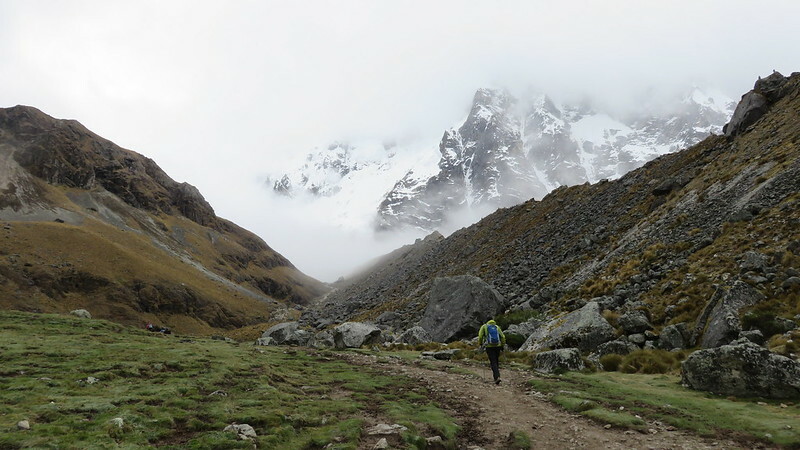 He was trailing behind a tour guide who was also walking very slowly behind the group he was supposed to be leading to Salkantay. This peregrino wasn’t part of the group. He didn’t pay any fee to be part of it, but how could he? He didn’t have the means to. He had no money; in fact he would only cost people money. He seemed desperate. I don’t know how he even got to this point approximately nine kilometers between villages and so high up on this mountain. The tour guide asked if we would help him find his way back and we agreed. I looked into those deep brown eyes and I melted. Of course I would help him find his way. He would die if we left him, so I reached down with one hand and scooped him up. He was skinny. His ribs showed through his chocolate-brown dusty coat. His hip bones protruded more than they should have and his tail curled between his legs. He yelped. Was he sore? Was he scared? Likely both. He looked to be nine weeks old, a little brown lab mixed with who knows what. 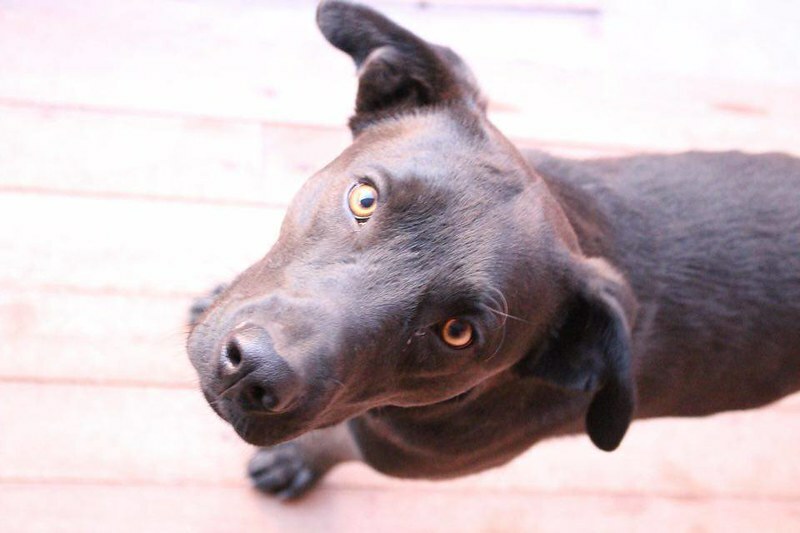 He had a lab face with ears that perked up and tips that fell forward. His toes were webbed, the sign of a future swimmer. I carried him the rest of the way. There wasn’t another village really, just a couple of sheltered areas where trekkers sat to take a break. Two grown dogs and another puppy played at one shelter. I put the little peregrino down beside them to see if they knew each other, but they didn’t seem to. The other dogs just sniffed around him curiously. The poor little peregrino, too tired to respond to the attention, found a spot to lay down. It wasn’t his home. That was obvious, so I scooped him back up again and we continued along for a few more kilometers, down through some lush shire-like hills with small homesteads nestled here and there and finally into our destination village of Mollepata. 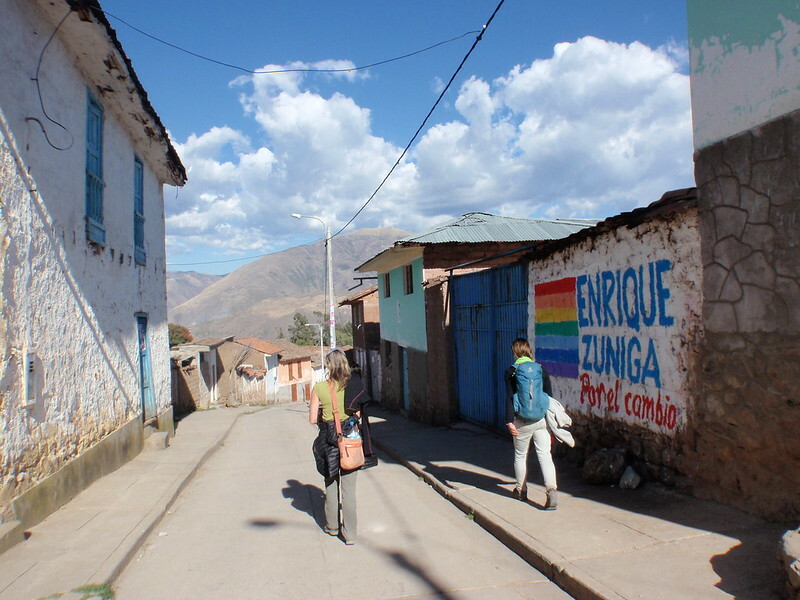 As we walked into Mollepata, I was bombarded with looks from the locals. A couple of women even stopped to sternly question me. I couldn’t understand what they were asking, however it was obvious the interrogation was about the puppy. One woman tapped on the little brown peregrino while she spoke. It seemed that they thought I stole him, so I constructed a broken sentence I could recite. “Solo en los montañas. Enfermo,” I would say. Whether they believed that or not didn’t matter to me. He would have died out there if I hadn’t picked him up. 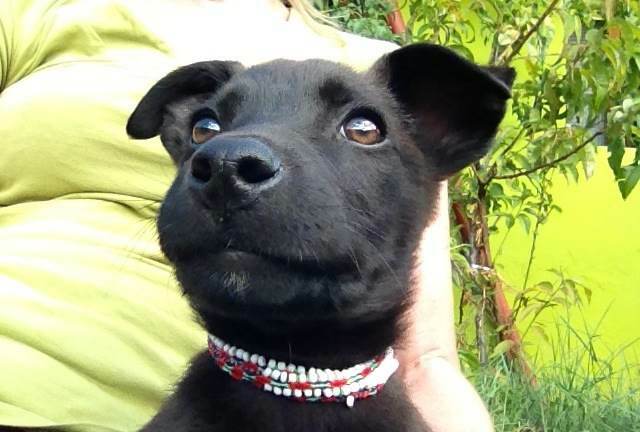 My next concern was what the residents and manager of Healing House would think about me bringing back a puppy. They have a no pet policy. Would they accept him while I figured out what I would do with him? Or, would I be sleeping at the Plaza de Armas fountain with the little peregrino snuggled in my jacket for a night? Either way I would deal with it. Luckily he was met with open arms and lots of love. Everyone showered him with affection and I was told that I could keep him until I found another home for him or for us. Yesterday, I taxied with him to the vet for his first set of shots, worm medication and a bath and to have his nails clipped. He looks and acts like a new puppy although he is still very skinny. It’s the worms. They are quite nasty actually. I’ve never seen them so bad in a dog. They have stolen all his nutrition and it probably didn’t matter how much he ate, he would never have gained weight as long as they continued to invade his little body. 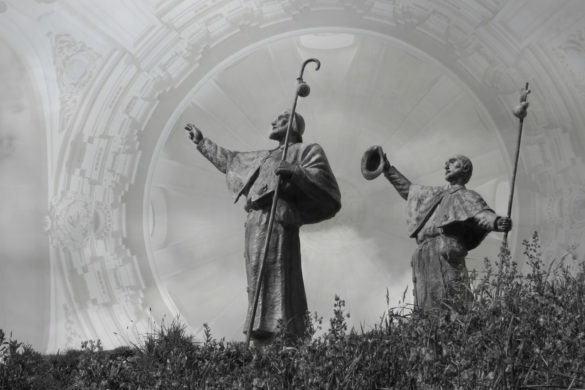 The worms were likely the reason he ended up on that trail between two villages. Someone may have realized he was not going to get well unless he was treated by a vet and maybe they didn’t have the money for that. 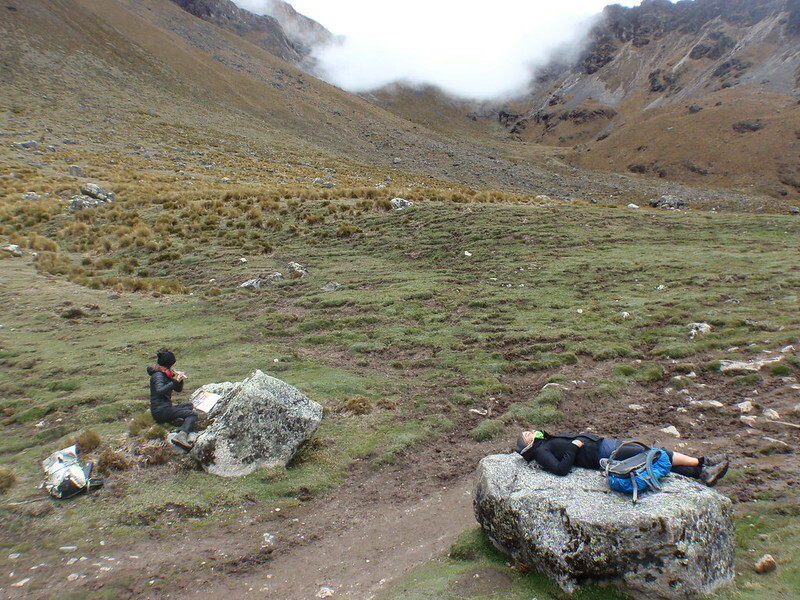 Maybe their plan for him was to drop him off on the Salkantay trail in hopes that a tourist would rescue him. Whatever the reason, he is safe now and he will get better. 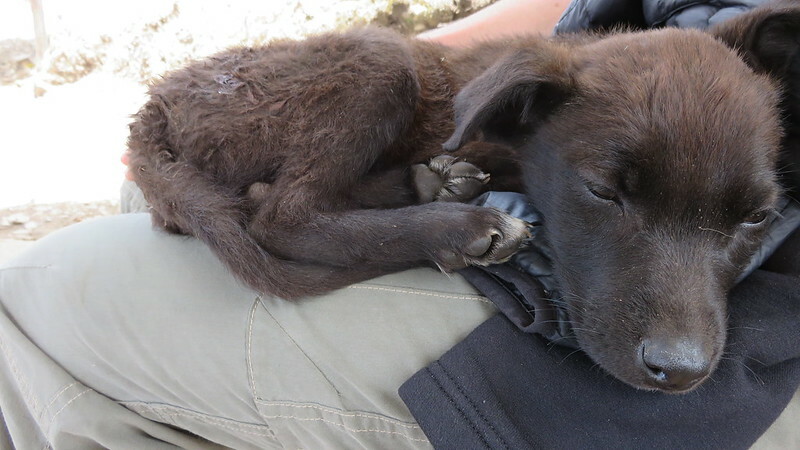 My next dilemma was how to continue my journey in South America with the responsibility of looking after a little puppy. He would need his entire set of shots including rabies at six months old before he would be allowed to leave the country. That would mean I would be limited to Peru for four more months. Am I ready for the responsibility of this? What did I come here for? There were so many questions. In my heart I wanted to make it work, to have a little side-kick peregrino with me on my travels throughout the continent, but would it be right? He could have a more stable life with someone else. These questions pulled at my heart. It was another struggle between the logic of my mind and the love I felt for this little puppy in my heart. This morning I made up my mind. Two wonderful women, who I met through the Healing House, are in love with the little peregrino and want so badly to adopt him. They have even come up with a name for him, Oso, which is the Spanish word for bear. Alex is training to be a naturopathic doctor and Arya is a yoga instructor. Alex has already created a special concoction to rid the little guy of his worms in case the medication he was given doesn’t work. 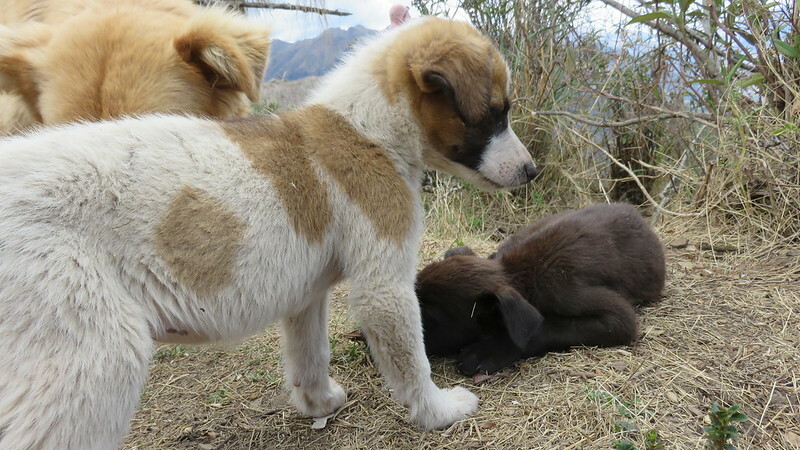 Alex and Arya share an apartment up the street from Healing House, but are planning to move to the Sacred Valley to live in the countryside instead, a beautiful environment for a growing puppy. Both will be living here in Peru for quite some time, enough time to get the little peregrino all his shots before either of them leave the country. Alex will try and bring him back to Portland, Oregon when she is ready to go home. It was hard to leave my little peregrino this morning. I’ll get to visit him though and see his progress on Facebook. I cried later and I even now as I write this. It’s amazing how attached one can become to another little soul so quickly. As I walked that day, his little body lying limply in my arms, I was re-planning my entire journey and my life around him, but in the end I know the decision I made was the best one for both of us. Update! This is the little peregrino as of November 23, 2015. He’s all grown up now! 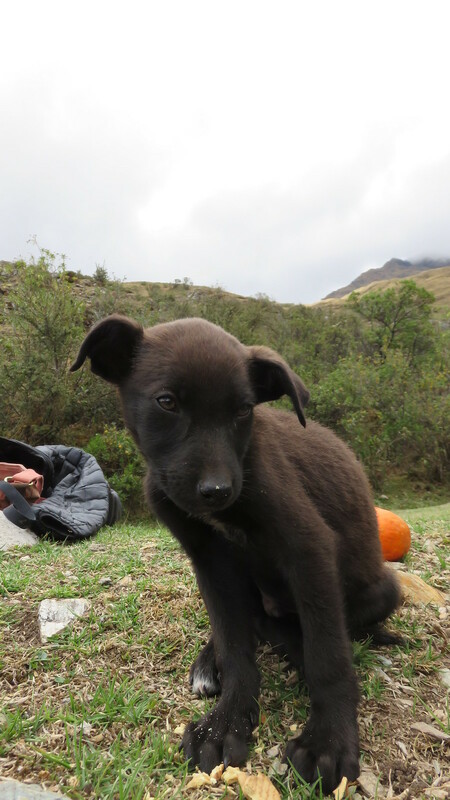 Currently he’s living a happy life with a Peruvian family in the Sacred Valley. Alex needed to come back home to Oregon and was not able to take him with her. She updates me regularly when she receives photos. Tanya, you write so beautifully. I totally understand your dilemma that you were faced with; you played a major role in getting him to a safe place with a family that was willing to take him in. You saved him by all that you did. I love reading about your journey there. Enjoy and stay safe! ! Wow. What a fantastic story. In my heart i was sort of hoping you would be stuck with puppy because it would make a good story. You did the right thing. 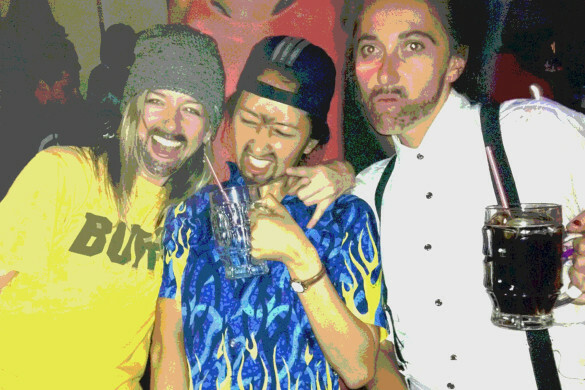 When you get back your going to have amazing adventures to tell….